For the rest of the winter into spring and summer, I am introducing weather lessons for anyone who is curious about the weather and how it works. I am hoping that by next winter, most weather terms will be covered and described. I hope to educate my readers and myself about the weather and its inter-workings. High pressure is a term many of you have probably heard of on the news. It is generally associated with dry, cooler, and sunny weather, but there are certain exceptions. Without high pressures in the atmosphere, there wouldn’t be many dry and sunny days! But what really is a high pressure? It is where the pressure on the surface of the earth is greater than the surrounding environment. The high pressure part, therefore, only describes what is going on at the surface compared to the atmosphere above. High pressure is usually an area of clockwise rotating winds surrounded by a hypothetical center marked with a H.
Depending on where the high pressure is determines our weather. If we have a “Bermuda High” (high pressure over the Bermuda area), we get warmer temperatures because of the southerly winds coming from the clockwise spin of the high. A high to the west of our area generally brings in the colder air, thus giving us the perfect setup for snowstorms. 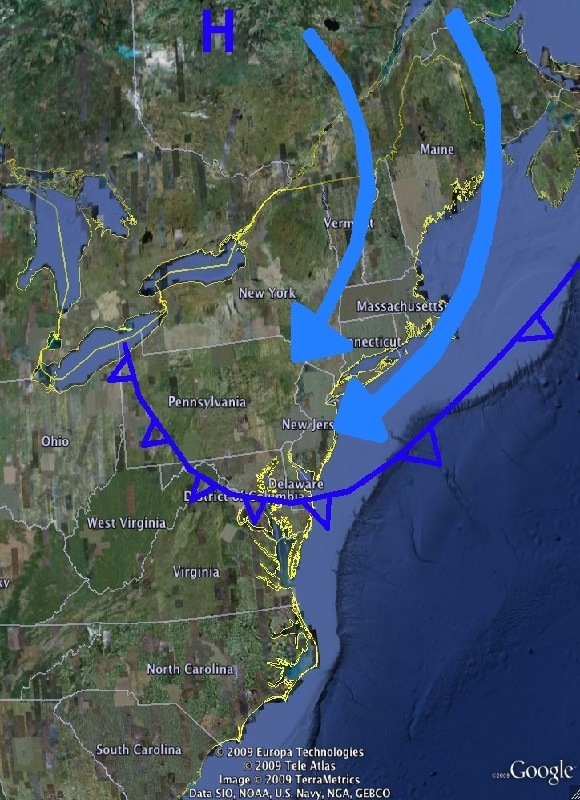 The perfect placement of a high pressure system for a snowstorm is in Quebec, where the winds come in from the north. The reason why the last storm (the ice storm) didn’t have enough cold air aloft was because the high was stuck up in southern Ontario, giving us a westerly flow instead of a northerly one. 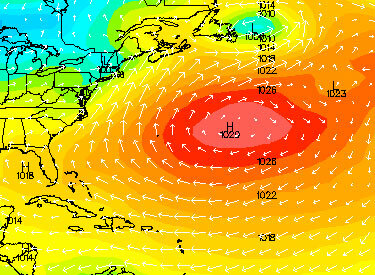 I will have another Meteorological Lesson next week, this time talking about low pressures. 5 day forecast to come on Wednesday or Thursday. Thursday Storm Bites the Dust; Warmer Temperatures Coming! Thanks for helping to clarify High Pressure & I’m looking forward to your future lessons.